In case you didn't read about wedding #1, this is wedding #2...just a week apart! This one had a completely different feel, being held outside in my Mom and Dad's backyard, and having a whole different theme. It was a whirlwind of excitement and lots of work at our house. Plus, add in visiting family (including five grandkids at the house) and things were really hopping! Once again, thanks to everyone who helped make both weddings successful. I will be forever grateful for wonderful friends and family! 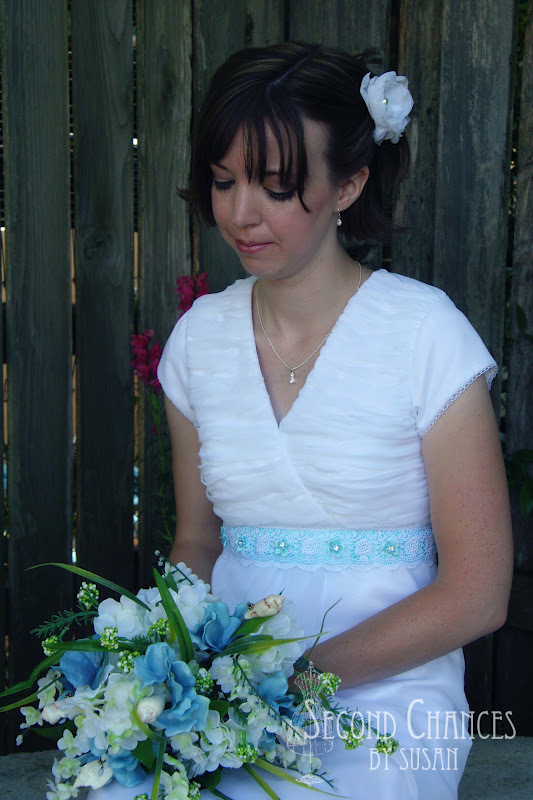 My daughter wanted a simple, lightweight dress since this was to be a summertime wedding. We really couldn't find an exact pattern so we had to wing it a bit. She chose white chiffon over satin. The top is ruched with the chiffon. The waist is embroidered lace over satin ribbon. Small ribbon flowers with pearl and rhinestone centers were used as embellishments at the front of the waistband. 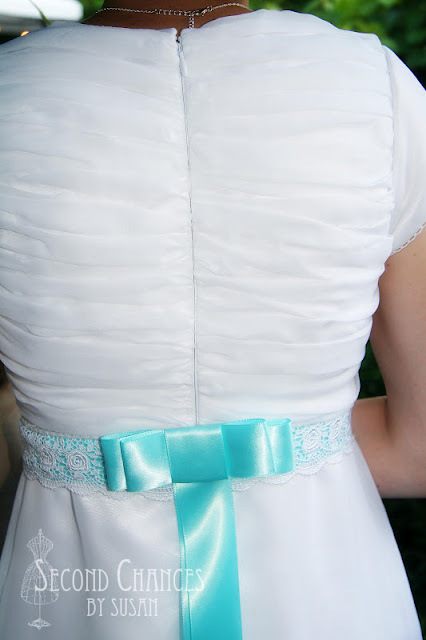 A satin ribbon bow adorns the back. The bodice gives the illusion of being wrapped in the front. Narrow crocheted lace trims the edge of the sleeves. 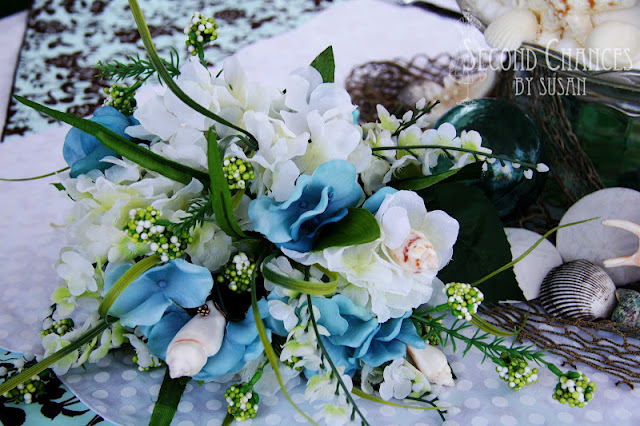 The beautiful bouquet was made by my talented sister-in-law. 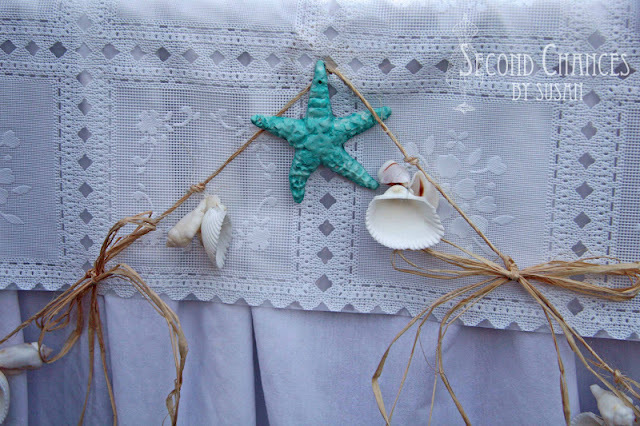 She even put wire stems on some shells and added them into the mix. 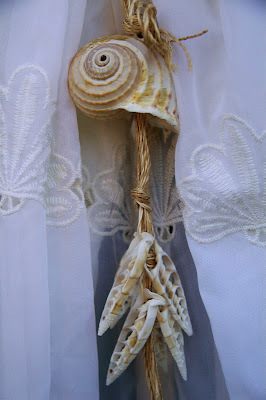 You can check out her creative jewelry at katalinajewelry.blogspot.com. The back of the dress also had ruched chiffon over satin. 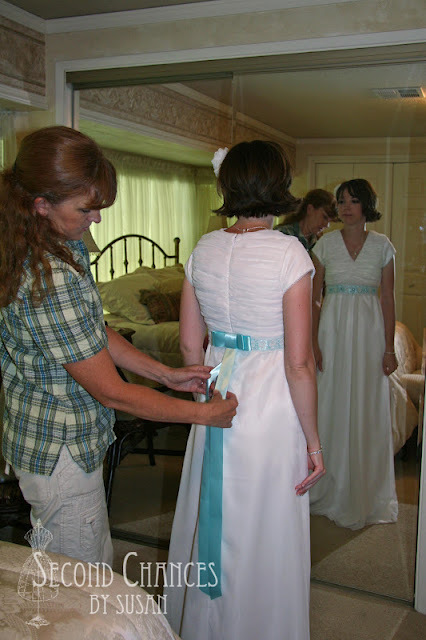 A simple satin ribbon bow completes the dress. In keeping with the beach theme, the guests could sign-in by putting a message in the bottle for the bride and groom. 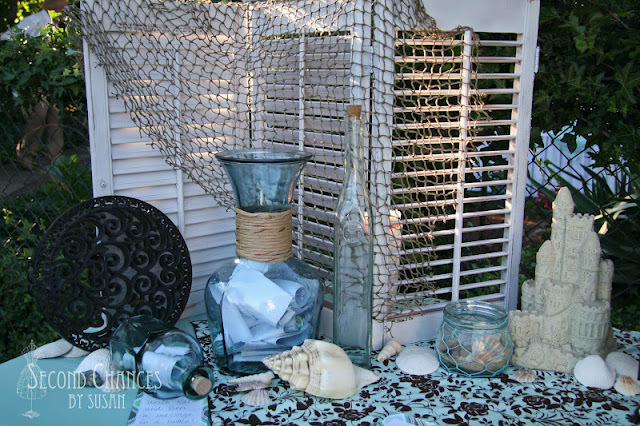 The tabletop shutters, used in the first wedding, take on a nautical feel when draped with fish netting. A sandcastle, shells, beach umbrella, and starfish-encrusted planter complete the look. 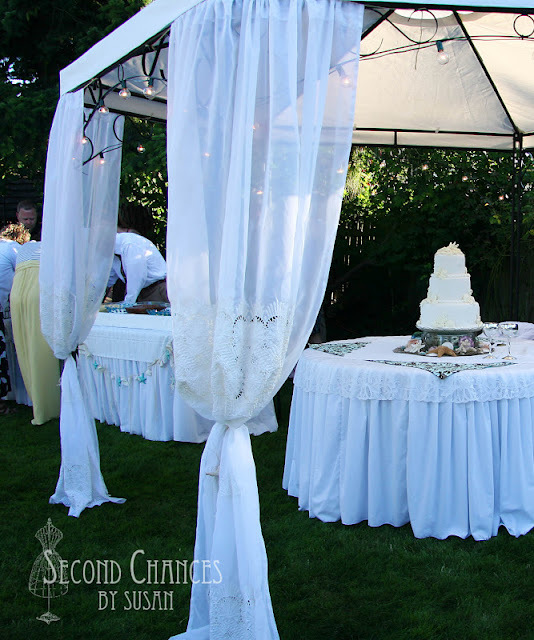 We got double duty from the table skirting and vinyl lace tablecloths used in the first wedding. 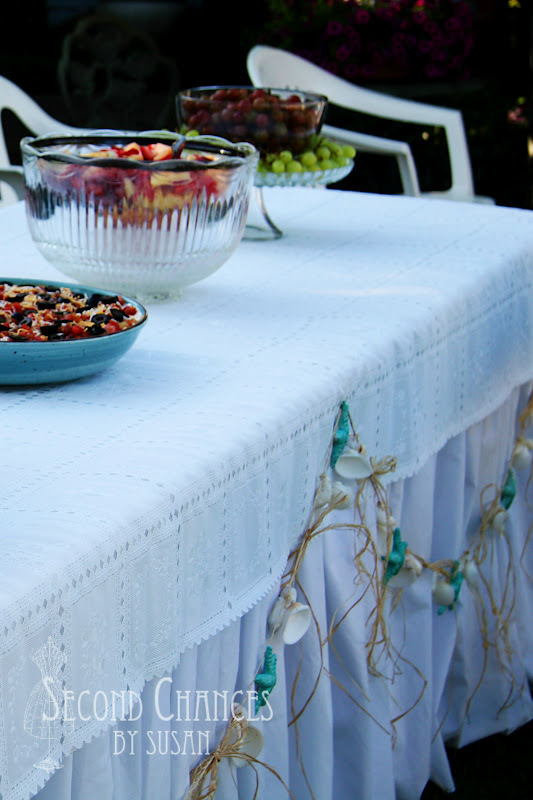 We kept the hot food hot with chaffing dishes, and the cold food cold by building a shallow frame with 2x4's, covering it with inexpensive plastic table covering, filling it with ice, and setting the bowls of food in place. It was simple and effective. 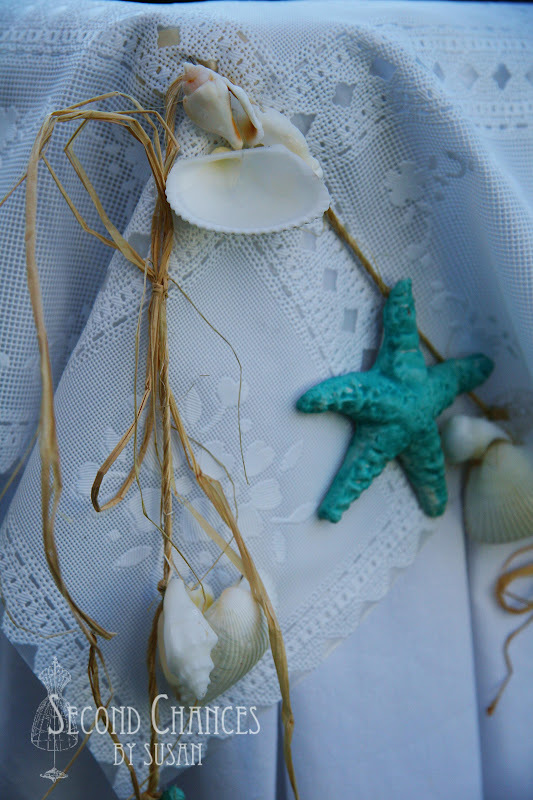 This time around the tables were decorated with a seashell and raffia garland. The aqua blue starfish were made using Sculpey clay and a candy mold. I pierced a hole through the top before baking so they could be strung onto the garland. I used the regular colored sculpey clay (the bulk packaging was cheaper than buying colored clay), then brushed some watered down paint over the starfish after first baking them in the oven. Raffia bows were tied onto the garland. 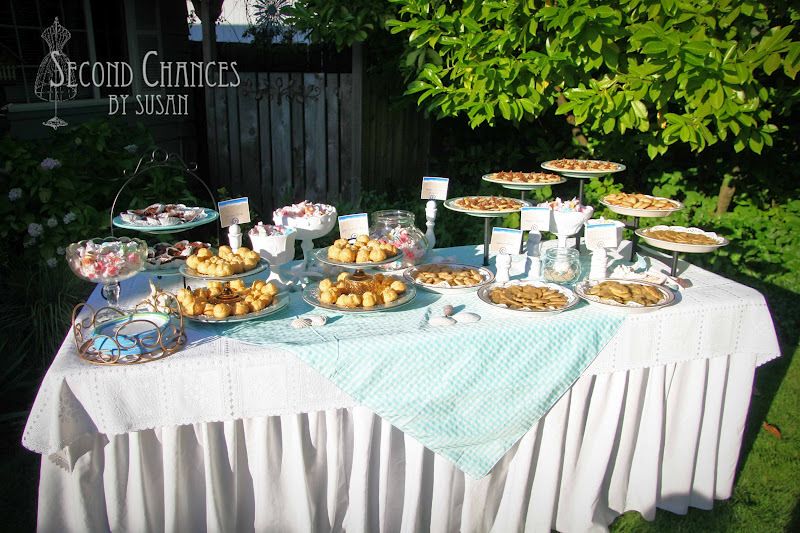 The dessert table was filled with varying heights of dishes filled with cookies, brownies, and cream puffs. 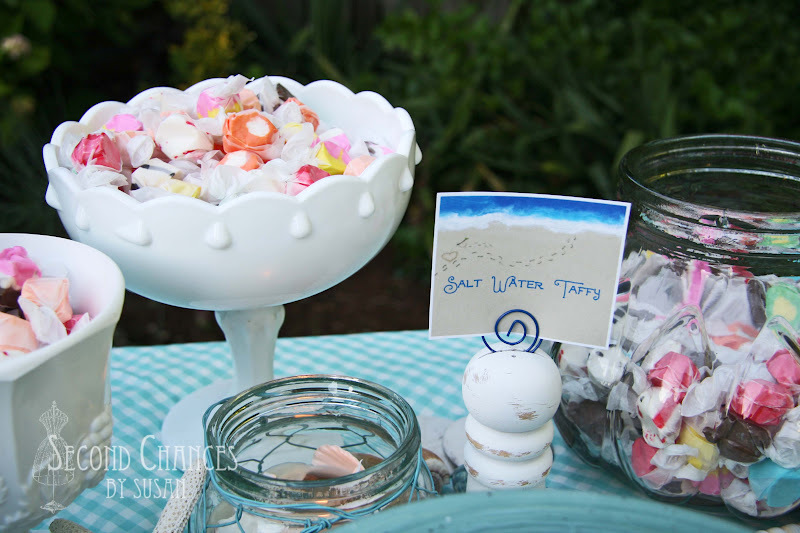 Salt water taffy was also a big hit at the dessert table. This multi-level stand is actually used to hold pillar candles. We used glue dots to secure the plates. 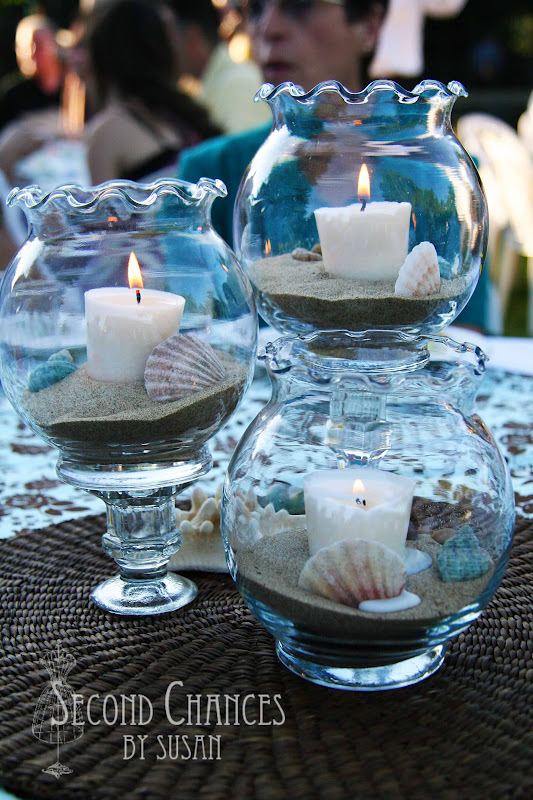 The centerpieces were very economical, considering most of the parts were purchased from the dollar store, including the fluted glass vases, candles, shells, and two candlesticks—one tall, and one short. The candlesticks were secured to the vases with glue dots. The dark brown, round place mats were purchased on clearance for 75¢ each. 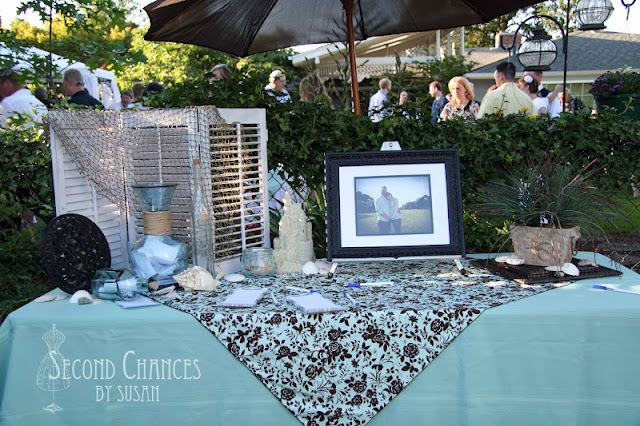 The gazebo has made the rounds for several receptions and even my Mom and Dad's fiftieth wedding anniversary. Once it even traveled from Oregon to Utah to be used at a reception. This time I added some sheer lace-trimmed curtains to the front to give it a more elegant feel. I picked these up for cheap at Value Village. 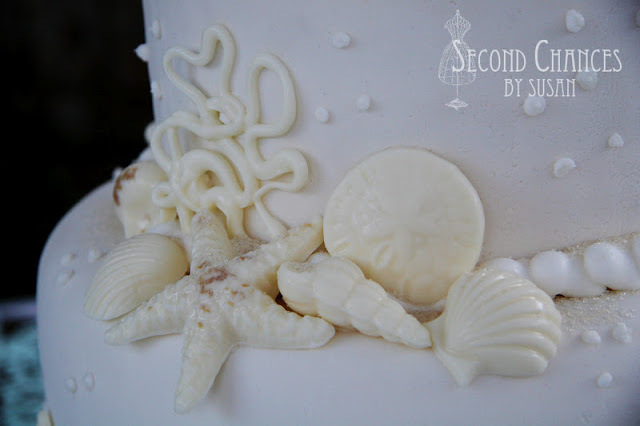 Having never done fondant before, I was fortunate to have a neighbor who had...and was willing to help! We decided to cheat and make only the top layer edible. The bottom two layers are actually fondant covered styrofoam. We just figured that Costco sheet cakes would be easier and more economical. I purchased a 2'x4' sheet of 2" thick styrofoam from Home Depot and cut the circles on the band saw. I then stacked and glued them together. My neighbor baked the top layer and then covered everything with fondant. I placed the whole cake on a clear crystal serving platter. The cake sat atop a clear, upside-down glass bowl with straight sides. Before doing so, though, I placed some sea glass under the bowl which almost gave it the look of water. (Actually, I had previously bought some green, aqua, and blue vases from the thrift store, broke them into pieces, and threw them into a rock tumbler. 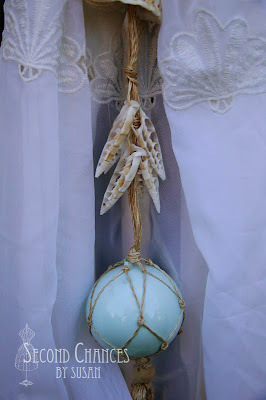 The effect was homemade sea glass. I have future plans for it, but for now it made the perfect addition to the cake stand.) 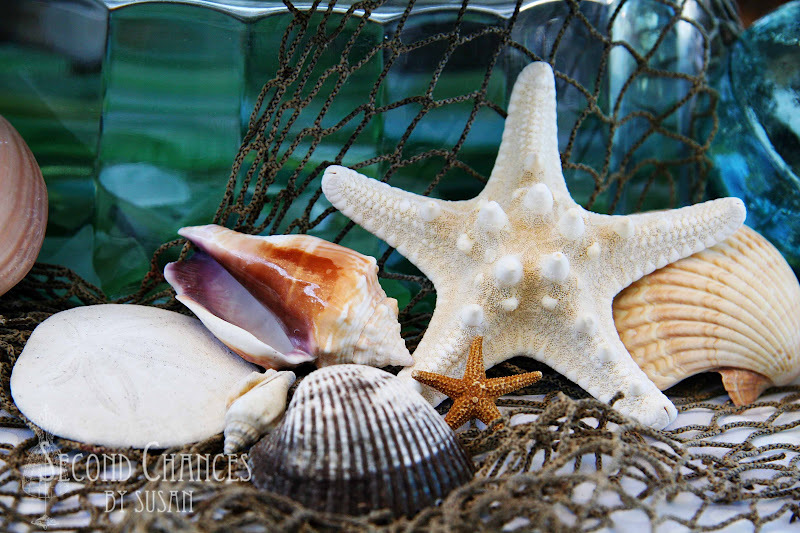 A fishing net was placed around the bowl and various seashells and starfish were added. 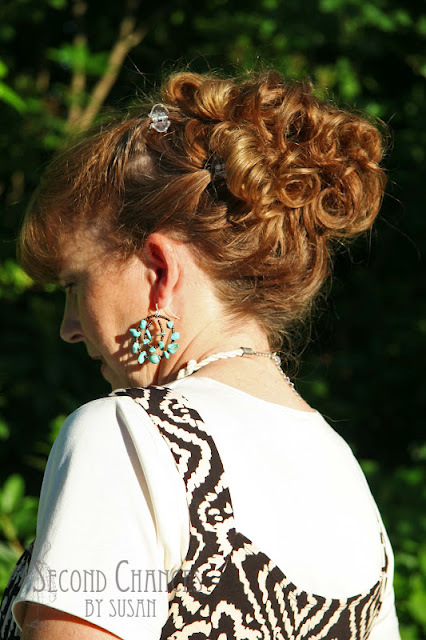 Okay, this has nothing to to with the reception decorations, but unbeknownst to me, the photographer took a picture of my hair, so I'm including it, along with the story behind it. Having been at my Mom and Dad's all day finishing up the final preparations, and as the groom's side of the family were showing up for pictures, I figured it was time to clean up and get myself ready. To my dismay, the bag that I had packed for myself was nowhere to be found. Well, actually, it was to be found...back at home! My sweet brother and his wife offered to travel all the way to the neighboring town and back to retrieve the forgotten bag, but I felt that surely someone from my house could bring it sooner. Needless to say, by the time my bag arrived I had about 15 minutes to the start of the ceremony. I was a mess, and my hair was definitely a mess! So, my girls came to the rescue. I felt like Sandra Bullock in Miss Congeniality when she was left on her own to finish the competition...remember how all the girls came to her aid? Well, I knelt on the bathroom floor and my girls were in a frenzy curling and pinning. They finished in record time and I attended the reception feeling much more presentable as the mother of the bride! Thanks girls! I have to say that doing two weddings a week apart was A LOT of work, but it was good to have family and friends around and we have come away with great memories! Thanks and you're right! I don't have a picture of them, but if you look at the close-up of the candy shells on the cake you can see the sand dollar. 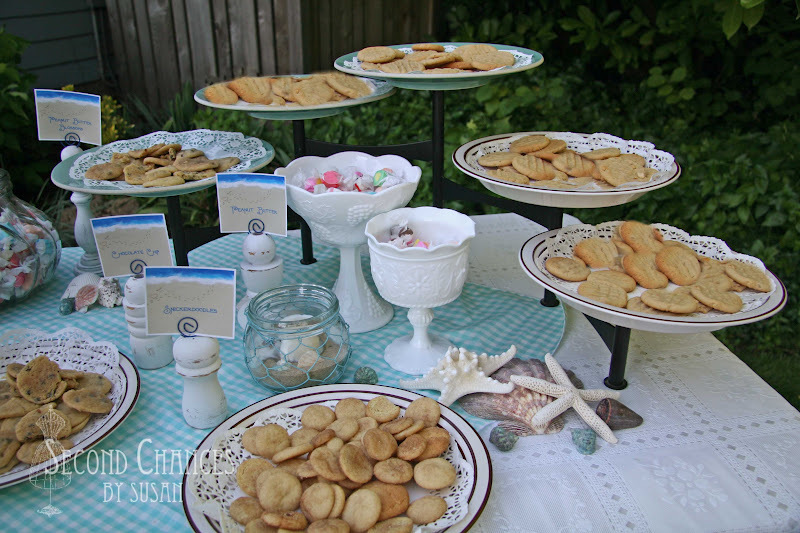 We actually made sand dollar lollipops for the guests to take home. We made them by crushing peppermint candies and mixing them into the almond bark. Then we placed a little bit of this into the candy mold, placed a pretzel in the center of the mold, then covered it with more of the almond bark/peppermint mix. We then wrapped them and tied a tag to them with the bride and groom's name, along with the wedding date. They were pretty tasty with the peppermint and pretzel! Sue, as with every event you plan, the decor and food was superb! Kara looked so adorable and her dress was beautiful! I'm glad the girls came to your "hair" rescue...it was darling! 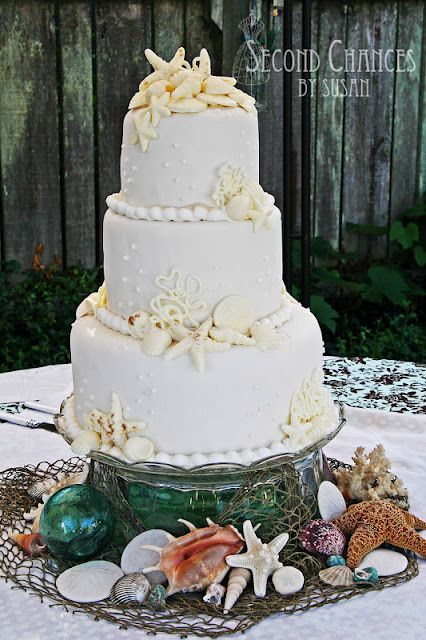 What a lovely wedding, the cake is gorgeous! All I can say is "WOW'! 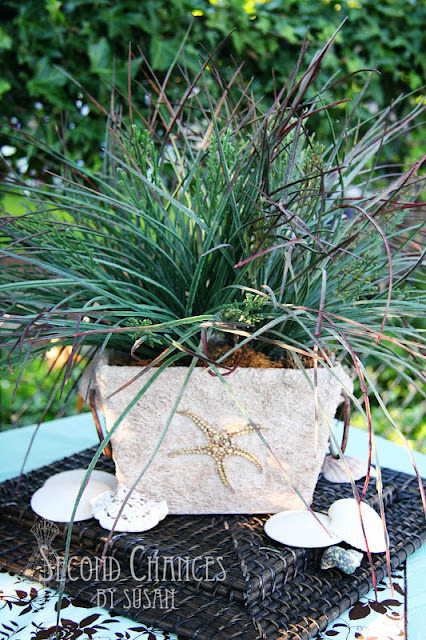 So many great projects rolled into one blog post! Your daughter's dress is just beautiful and I am super impressed with that zipper installation with all of that ruched organdy. The cake is so very clever. I can really identify with you in not having enough time to get yourself ready for the wedding...I did the same thing (almost) at my daughter's wedding (but your hair turned out better than mine). Congrats on being featured over at Boogieboard Cottage. Top class quality blog. If you need help with your wedding planning there are a lot of tools available online. But it's hard to find a good wedding seating chart maker that meets your expectations. 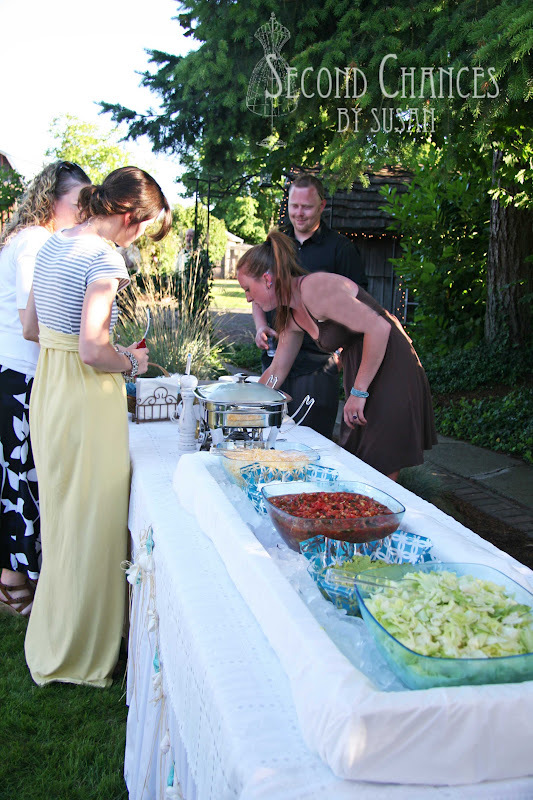 Check out this event planning software for a stress free wedding.